Semele was the beautiful daughter of Cadmus and Harmonia of ancient Thebes. She was the sister of Ino, Agave (Agaue), Autonoe and Polydorus. She was so beautiful she got the attention of Zeus who wished to mate with her. Hera, the wife of Zeus, found out about Semele and tried to trick her to eliminate her as a rival. Hera told Semele that her sexual relations with Zeus would be best if Zeus would appear in all his glory. Semele made Zeus promise to appear this way but when he did she was burned to a crisp. 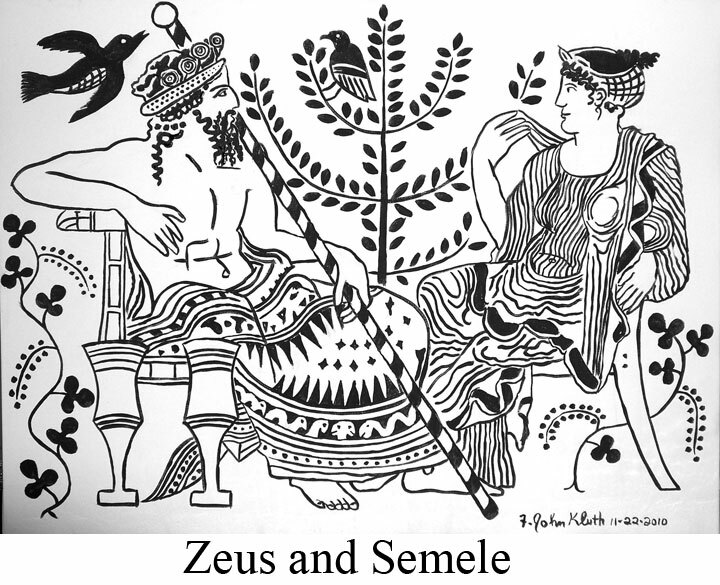 Evidently the relation of Zeus and Semele took some time because Zeus saved a baby from her body and was able to preserve it in his thigh. That baby was the god Dionysus. At any rate this is the myth that comes to us from ancient Greece. In the Bacchae of Euripides Dionysus states that Semele was killed by a thunderbolt that was brought about by Hera. The Chorus states that Zeus hid the baby in his thigh. The other parts of the story were added by later authors. And so Semele the goddess of the heat of summer must be the mother of Dionysus, the god of grapes.